Mike Birbiglia is a man who wears many hats. He’s a comedian, writer, actor and now, a director. He’s also a sufferer of rapid eye movement behavior disorder, a medical issue that causes him to sleepwalk. 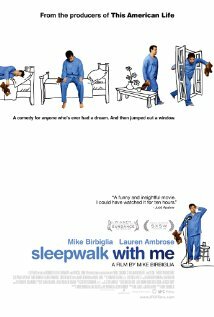 This unique disorder has served as the catalyst for much of Birbiglia’s latest work, and it has culminated with his directorial debut: Sleepwalk With Me. While sleepwalking does play a part in the film — it leads to many laughs and some “did he really do that?” moments — it is mainly a backdrop to a story that serves as a sort of delayed “coming of age” for Birbiglia’s character of Matt Pandamiglio. Matt is a 30-something bartender whose dream is to one day be a successful comedian. The only problem is that he isn’t exactly working hard to achieve that goal. 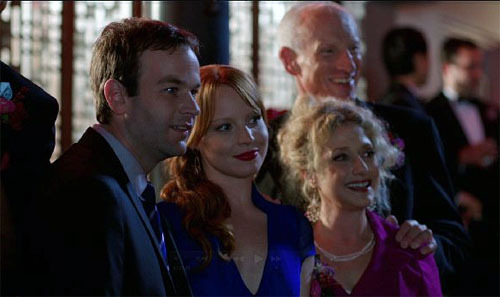 The best part of his life is his beautiful girlfriend of eight years, Abby (the fantastic Lauren Ambrose). He is lazily stumbling through life, dodging the idea of marriage while seeming content to clean up vomit in the bathroom at the end of his nights. A meek encounter with a low-rate agent gets him on the road, and somehow, someway Matt begins to find his voice. Now, right away Pandamiglio isn’t an entirely likable character. Sure, he’s charming and often very funny in an everyman kind of way, but there are times when it’s hard to empathize with his slacker persona. It takes some time to get behind him, but as he builds confidence, so do we in his character. It helps that Matt comes across as a genuinely nice guy; the socially anxious type who may fumble with his words but means well. It’s a lot of fun to watch him grow, especially as his sleepwalking becomes more and more frequent. Pandamiglio assures us multiple times throughout the film that all of the sleepwalking incidents are completely real. The final incident is absolutely shocking, and Birbiglia has some real world scars to show for it. There is a deeper message to the film beyond its laughs, as it also examines relationships, marriages and other long-time partnerships, forcing us to look at them in a different way. The appeal of this film ultimately comes down to Mike Birbiglia and whether or not you find him funny. I found myself cracking up at many of his jokes, including his early standup bits that were meant to be old, tired bits. There is a certain type of charm with Birbiglia, almost like a more likable Woody Allen. Sleepwalk With Me currently has a limited theatrical release, so most will unfortunately have to wait for the DVD to see this. As it stands, this is one of the funniest, most likable films I have seen this year. Keep an eye on Birbiglia — he has some serious potential as a filmmaker. Sounds like it might be an interesting one… at the very least it’s different. I’ll keep an eye out for it when it hits DVD… Eugene/Springfield almost never get the “limited” releases. It’s a good one, Morgan. Kind of reminded me of another underrated comedy this year — The Do-Deca-Pentathlon. Both are worth seeking out for fun, light-hearted viewings. I’ve never even heard of Mike Birbiglia but this looks interesting! I usually avoid comedies that are too vulgar or has too much foul language, hopefully this isn’t one of them. Nope, this one isn’t vulgar at all. I think you would enjoy it, Ruth! No problem, Scott. It’s one to keep an eye out for.